Vadehra Art Gallery is proud to present a group show of works by artists Pranati Panda, Shailesh BR, Jasmine Nilani, Umesh PK, Apnavi Makanji, Triborlang Mawlong and Shrimanti Saha from April 11 to May 20, 2018. Titled ‘Remembering the Present’, the exhibition covers a range of artists working across diverse mediums to arrive at an understanding of the notion of ‘narrative’. The works on display initiate a dialogue through image and viewer through implicit references that inform each other directly as well as tangentially. The artists engage with the idea of narrative in unique ways that make vernacular stories and histories visible through multifarious vocabularies. The exhibition is an enquiry into the self-sustaining practices of these artists where human memory and perception become a central concern. Shailesh BR has channeled his concern with the political and the mythological through the depiction of a variety of leaves with nomenclatures in vernacular tongues. An attempt to re-imagine the purpose and function of every-day objects around him in their functional disparity, Shailesh’s works display elements of the whimsical. 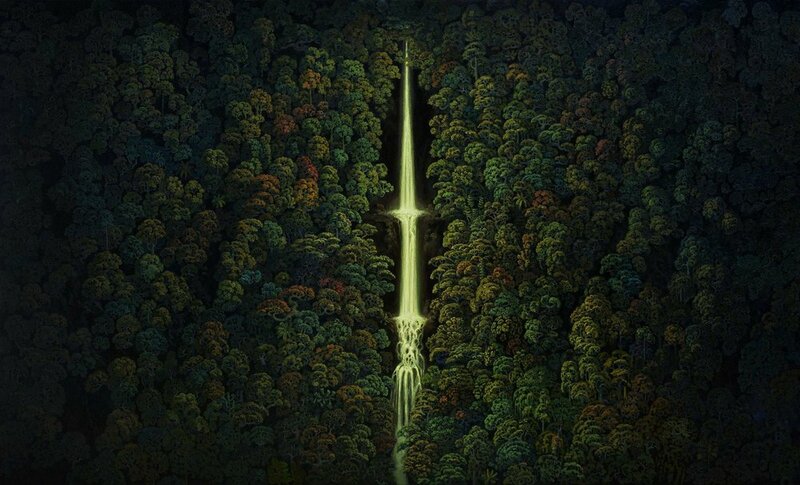 Artist Umesh PK’s visual vocabulary teems with lush landscapes that border on the mythical. Cosmic in scale and intent, his paintings seem to evoke a verdant imagination where material objects are reconstructed for referential verisimilitude. 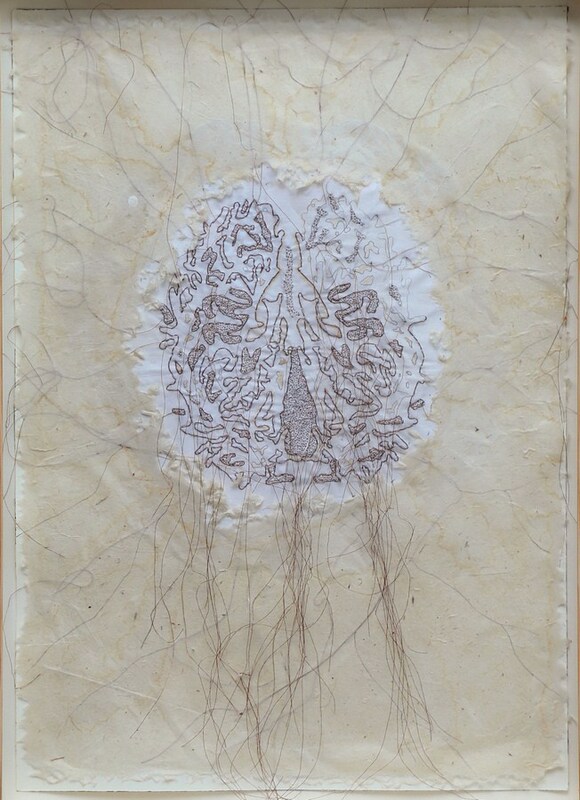 Using a range of material including paper and fabric, Pranati Panda sutures abstract images which are hand-drawn and subsequently embroidered and painted upon. 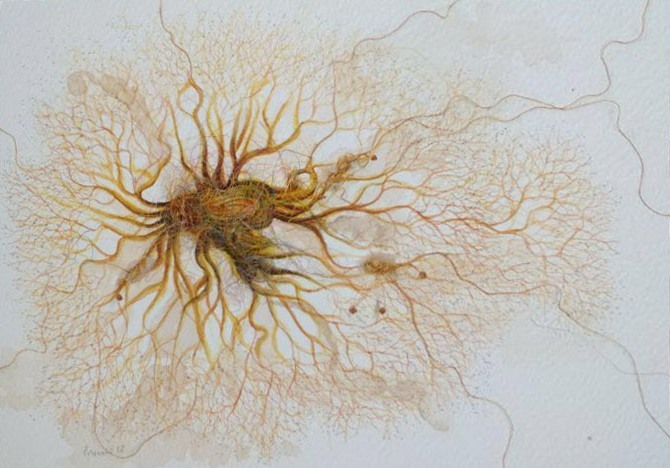 Her subjects include organs of the human body, insects, plants and similar objects of organic make which are represented through playful juxtapositions. Apnavi Makanji’s work spans a range of media including drawing, installation and video. Informed by memory, botany, ecology and the Anthropocene, her works strive to examine the fetishization of the currencies upon which economic systems are built, thus questioning the fine balance (or the illusion of the same) between absence and presence, nature and its routine commoditization. Artist Shrimanti Saha visits mythological tales and tries to bridge the gap between their visual depiction and oral dissemination. Taking a cue from historical texts, Saha takes inspiration from science fiction, philosophy and evolutionary biology to create works populated with details. Treibor Mawlong creates woodcut prints, portraying characters suspended in thought and action. Mawlong draws his subjects from Khasi folktales where he chronicles the folk tales of the tribe through graphic illustrations in monochrome. Jasmine Nilani takes a similar approach to her identity which is explored through the architectonics of space as they manifest in her memory of her homeland. As a child who was forced to flee her hometown in Jaffna, the horizontally suspended fences/barricades in her work carry implicit references to the repercussions of war ranging from language inequalities, insecurity and memory. Depicting monuments and spatial junctures that have remained in the artist’s psyche, Nilani merges autobiography with introspection into larger systems of oppression and to produce questions around geography, language and agency. Treibor Mawlong completed his BFA and MFA from Kala Bhavan,Visva Bharati Santiniketan in 2010 and 2012, respectively. He is the recipient of the Lalit Kala Akademi scholarship Grant in 2012-13 and Inlaks Fine Arts Award in 2014. Mawlong is inspired from folklores, his personal experiences and memories as themes of his artworks. He has been experimenting with formats of picture books, graphic novels often using drawing as his primary mode of expression. He lives and works in Shillong. Shrimanti Saha completed her BVA (Painting) Faculty of Fine Arts, 2009 and MVA (Painting) from Faculty of Fine Arts, MS University, Baroda 2011. She received the Inlaks Fine Arts Award in 2015. She received the Krishnakriti Scholarship, Hyderabad, in 2008 -11 and has participated in residencies such as the Taj Residency and Ske Project, Bangalore, 2015 and Kalakriti Artist-in-Residence, Hyderabad, 2015. She has been part of group shows at Nature Morte, Gurgaon; Gallerie 88, Kolkata; Barter Collection, Mumbai Art Room, Mumbai amongst others. Born in 1976 in Bombay and brought up in Geneva, Apnavi Makanji has benefited from two vastly different cultures. An autodidact, her practice revolves around a composite of issues: displacement, social conditioning, environmental concerns, explorations of memory and the idea of “home” and how this synthesis interacts with the construct of urban spaces and the socio-economic structure of our times. Makanji has had several solo shows including travails of the Wandering MemorySeed, Galerie Felix Frachon, Brussels, 2016; Dog Eared pop up library, Matthieu Foss Gallery, Mumbai, 2011 amongst others. Pranati Panda studied BFA at the College of Art and Craft, Bhubaneswar and did her MFA at the Delhi College of Art. Provoking grief and menace, Panda’s paintings are symbolic in their showing of inner feelings and mental disturbances. Her paintings offer meticulous detail, with easy flowing lines and interesting textures and motifs. Panda has participated in several group shows, and was awarded the Orissa State Akademi Award, 1993. She lives and works in New Delhi. Shailesh BR has received his Bachelors in Fine Arts, specializing in painting from Chamarajendran Academy of Visual Arts, Mysore and has a Post Graduate Diploma from Faculty of Fine Arts, MSU, Baroda. He has participated in various group shows, CIMA Art Award Show, Kolkata (2014); Drawing 2014: Seven Decades of Indian Drawing by Gallery Espace, Delhi (2014); and Students Biennale Exhibition, Kochi Muziris Biennale, Kochi (2014). He has been part of the Khoj Peers 2015 as an artist-in-residence and was invited for the Khoj Peers Share in October 2013. In 2014, Shailesh has received the Inlaks Fine Arts Award and was also invited to Sandarbh Art Residency, Partapur, as an artist-in-residence. Shailesh BR lives and works in Vadodara. Hailing from Kerala, Umesh PK completed his Masters in Fine Arts (Painting) from S.N School, Hyderabad Central University in 2008. He has had several solo shows including Lucid Dreams, Sakshi Gallery, Mumbai, 2017; Another life is possible, MNF gallery, Kochin, 2016; Sound of Silence , Kalakriti Art Gallery, Hyderabad, 2015 amongst others. He was an artist-in-residence at at Harmony Art foundation, Mumbai in 2015. Born in 1990 in Jaffna, Sri Lanka, Jasmine Nilani Joseph is an emerging artist who pursued visual art at the University of Jaffna. Her works revolve around barricades denoting its significance in her life and the history of her homeland. Her latest exhibition was ‘Self Portraits’ at Saskia Fernando Gallery, Sri Lanka, 2017.